Tuck Boxes are the traditional option for packaging and printing of a variety of products. They are made by folding the corrugated paper in to a box shape. They are used for many purposes. The main use of them is to protect the product from any external influence. They are also used for making the product to stand out from any other competitor. They are used for the packaging of soaps, pillows, windows, bakery goods, cosmetic products, cloths, shoes, electronics and many more. These boxes are made so that they can be recycled and can be re-used. They are echo friendly and easy to assemble. 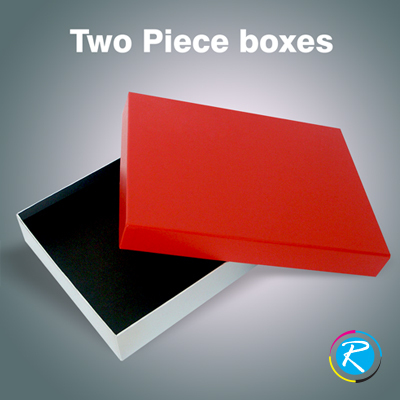 Two Piece boxes are very popular for the luxurious tuck packaging boxes. They are mostly used for gift and retail packaging. This is not the only use of Two Piece box but they are also used for many more purposes like Smartphones, Tablets, perfumes etc. These boxes come in many sizes and shapes. They are very attractive and enhance the worth of the product. They are the most durable type of packaging. Many indoor games also come in this type of packaging. 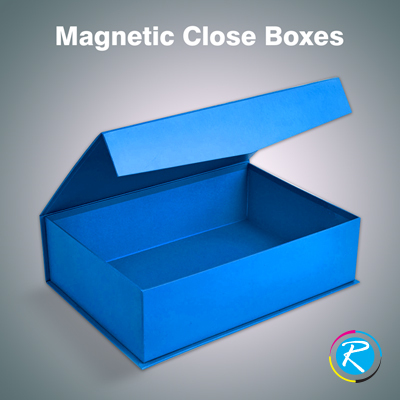 Magnetic Close Boxes are made up of high density paperboard. These boxes have book flaps with hidden magnets. These flaps snap shut in their places. The magnetic catch makes the opening and closing of the box very easy. Any type of design that is to be printed is printed on glossy paper that wraps around the box. This feature is good for long flat boxes. These boxes are usually used for indoor games like Monopoly, Card Decks and many more. These boxes are very strong and they look very elegant. They are used for gifts also. Sometimes, there is a stuffing of soft foam or cotton so that if the box has fallen then the product inside it is provided with extra protection. This stuffing will cushion the blow. 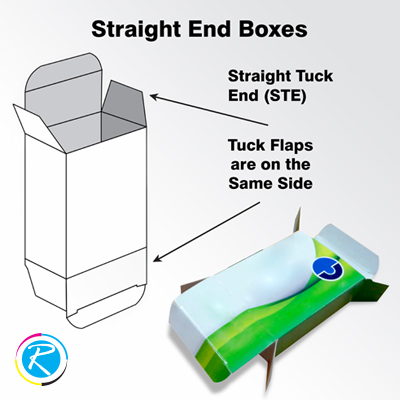 Snap lock Bottom Boxes are folding bottom boxes in the list of tuck packaging boxes. They are also called as 1-2-3 bottom boxes. They are able to hold heavy weights without being damaged. They do not require any type of tape to seal shut the boxes. There are four bottom flaps that interlock with each other to seal the box shut. There is a tuck top on these types of boxes. These boxes are used for many purposes like Cosmetics, Food, Medicine, Pharmaceutical and Retail Packaging. 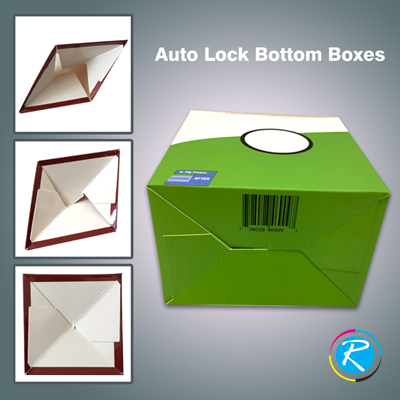 Auto Lock Bottom Boxes are always available in flat shape. We just have to push on both sides of the flat paperboard and it will pop open. The bottom of the packaging box will also automatically lock in its place. These types of boxes are used for electronics and many more. They are easy to handle and carry. These types of tuck boxes are used for many purposes. These boxes are the best for toys and software. They come in any sizes and shapes. 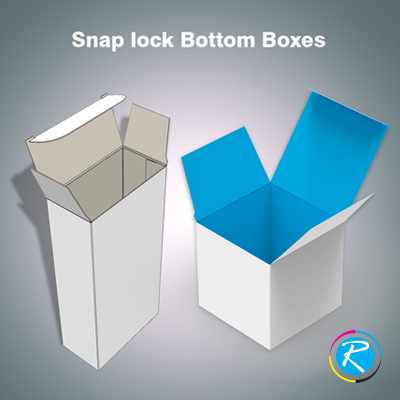 We at RegaloPrint, create packaging boxes to suit the individual specification of each product to be placed inside. That’s what makes us so great at delivering world class packaging services. Because we learn the product before designing its container box. We enable our clients to customize every decision regarding their product boxes; they can choose the color, the material, the size and printing layout while we guide them how to obtain optimal benefit from their choices. 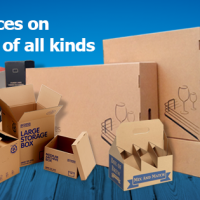 RegaloPrint offers a huge variety of customizable packaging boxes that include cardboard boxes, kraft boxes and corrugated boxes. Depending upon the weight and other requirements of your product, you can order boxes at Regalo in any custom colors shapes or sizes. You can order tuck boxes, retail boxes, software boxes, bakery boxes and beverage boxes etc. & we will custom build them to attract your customer base while keeping your product secure. We are known in the market for our product’s reliability, quality and affordability.